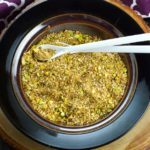 Dukkah is a flavorful Egyptian condiment, that you will want to add to everything once you try it. You can customize it using your own mix of nuts, seeds and spices. This one is made with pistachios, coconut, coriander, sesame, fennel and cumin seeds. In a medium not stick skillet dry toast coriander, fennel and cumin seeds until fragrant, about 2 minutes, over medium heat. Watch them carefully to make sure they don’t doesn’t burn.